It’s back-to-school time. 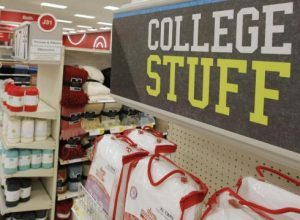 Students have probably been shopping online for weeks now (if not months), and maybe even some are still scrambling to figure out just what exactly they really need before setting off in the far away lands of college campus-ville. Freshmen have the most difficulty in knowing exactly what they need. They haven’t been there before, so the little things can sometimes be forgotten. Lap Top Computer – Today’s college students need computers. Most campuses are even mandating computers and giving students the specifications for the features required for coursework and study. You may already have a desktop, but what about the occasions where study groups, group projects and presentations, a noisy roommate, and the need to work on breaks or other locations occurs and the convenience and mobility of a laptop is beckoning? Even if you don’t plan to do a lot of work with it, at least it can be used to play CDs and watch DVDs! Thumb Drives – It’s always a good thing to have something to back your work up onto. Key chain drives are probably the most popular as they go where you go, and unless you lose your keys, your saved files won’t get lost. Printer – Students need a good quality printer to be able to print papers, as well as research documents. A quality 3-in-1 printer will also mean that students will not waste precious time (and money) running to the library every time they need to print or copy something. Ink For Your Printer – Purchasing individual cartridges can get expensive, especially when buying from the campus book store. Having ink for your printer is obviously very important and seeing as you’re on a budget, we suggest you buy wholesale and get a package deal as opposed to buying one at a time. You’ll be thankful you bought the 3-pack when you’re mid-way through printing that 30 page document and you’re running extremely low on ink. Docking Station and Speakers – The popular thing to have to accompany any iPhone or iPod these days is a great all-around portable docking and speaker device for the dorm room. Usually they’re a great buy and trust us when we say, yes, you need one for those long study nights and (cough) dorm room party nights. iPad – Not to be a shameless plug for Apple here, but college students should give some thought and consideration towards purchasing an iPad with their hard-earned money. There’s a LOT of reasons why the iPad can be of great assistance to a student. Plus, we know you already want one, so we don’t have to really say anything else about it, do we? Bathroom & Laundry Supplies – Bulk quantities of soap, shampoo, body wash, hairspray, hand soap and toilet paper will be a welcome addition for any college student living away from home. Laundry soap is one of those necessities that you can never have enough of. And don’t forget fabric softener or sheets while you’re at it. Organizing Bins – Another real necessity because we all know how quickly stuff can accumulate. To make sure all of your stuff fits and to prevent the room from feeling cramped, you need to organize. Storage bins that can stack on top of each other and utilize height instead of floor space always work best. There are a variety of bins that can stack, slide under the bed or even connect to create a make-shift dresser. New Backpack – Who says backpacks aren’t cool anymore? Backpacks are functional, stylish and fun. In addition to style, make sure you choose one that is sturdy and well made to avoid re-purchase during the school year. Every student needs one, and with the growing proliferation of laptop computers on campus, getting a bag that will accommodate books and a computer is essential. You’ll soon realize that the most important item for school may very well be your backpack. Quality Bedding: If you’re a freshman, it’s pretty obvious that you will need bedding for your new bed, but choosing which bedding to get may not be so obvious. A lot of schools provide a service where you can buy cheap bedding from them, and while that is an easy option, it’s often not the best option. You’ll be sleeping in the same bedding for almost a year, so you want to make sure that what you get is comfortable. Also, depending on where you go to school, you may be in for some cold winter nights, so make sure to buy a heavy comforter for winter. And what about a mattress pad? Dorm mattresses are notoriously uncomfortable. Your back will thank you later for investing in some kind of mattress padding. For more information about Collegiate Marketing Group and the various services we offer, including youth marketing, social media and communications services, please visit our website at cmgmediaagency.com and connect with us via our Quick Connect.